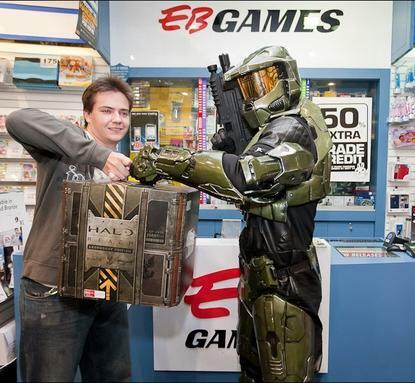 Pictured: The first customer at Halo Reach's midnight Sydney launch. I dropped by Best Buy yesterday for a copy of Windows 7. Best Buy locks up its "real" versions of Windows 7, so the sales guy had to walk across the store to grab a copy from the Geek Squad. While I waited in checkout, I watched three guys roll through the adjacent lanes with copies of Halo: Reach. I noticed several more clustered around the game's display stands, which dominated the central sales area just inside the entrance. One guy, probably a teenager, was trying to convince his mother to pick up a copy. He wasn't really looking at her though, just pleading vacantly, his eyes laser-locked on the limited edition version, which comes in a weighty hexagonal "black box" case. Halo: Reach looks to be another Halo phenomenon. The game's developer Bungie tweeted earlier that the game had already cruised past Halo 3's record for "concurrent unique users" on Xbox LIVE (translation: the number of gamers simultaneously playing online). I'm not sure how many that is, but I wouldn't bet against "a lot." Bloomberg reports that Microsoft's predicting Halo: Reach will outsell Halo 3, a game that itself broke records, generating a cool $600 million for Microsoft ($300 million in its first week alone) on sales of some 10 million copies. We don't have Halo: Reach's sales yet, but for those who care about numbers, I'd wager Reach's will be in the stratosphere. If you like what Microsoft's done with Halo: Reach, that's great news for you, since the next game--almost certainly a followup to Halo 3--sounds like a shoe-in. And if you're one of the handful less enthusiastic, there's always the off chance that a non-Bungie designed Halo could give the series the creative shot in the arm it's arguably been lacking since the original.